With a little bit of know-how and imagination you can transform any left over into a nice meal. Here, nothing goes to waste, everything can be recyclable except if it has been “ forgotten” in the fridge for too long. 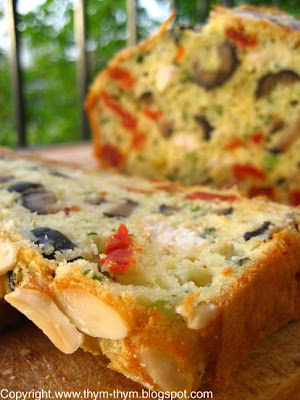 In this recipe, I took some left over roasted chicken and turned it into a Provencal cake. Usually when I make savory cakes I use Parmesan or Gruyere cheese, but this time I went with another cheese that I discovered this weekend. It is called Bianco Sardo (named after the basket that it is matured in). It’s an Italian sheep’s milk cheese from the region of Puglia, south east of Italy. The texture of Bianco Sardo looks like Parmesan cheese. It has a dense, crumbly paste. Its flavor sweet, tangy and reminds me of Comte cheese. The silvered almonds give a nice, crunchy texture wich I was very pleased with. Mix the flour, the cheese and the eggs. Milk the milk slowly while whisking. Add the ginger and season with salt and pepper. Add the chicken, olives, tomatoes and chives and mix just until blended. Do not over mix the batter. Pour the batter in a buttered cake mold. 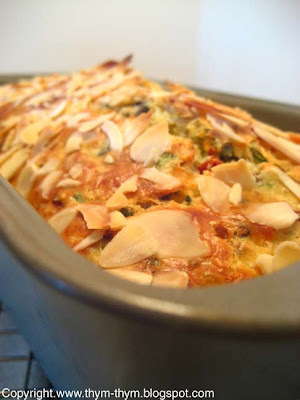 Top the cake with silvered almonds and bake in a preheated 375F oven for 45 min. Let cool in the mold for 10 min then on wire rack. Serve warm. Melanger la farine, le fromage et les oeufs. Delayer avec le lait. Ajouter la levure, sel, poivre et gingembre. Bien melanger. Ajouter le poulet, les olives, les tomates, et la ciboulette. Melanger doucement a fin d’obtenir un mélange homogene. Mettre dans un moule a cake beurre. Couvrir le cake d’amandes effilees et cuire pendant 45 min dans un four prechauffe a 180C. Laisser refroidir dans le moule pendant 10 min puis demouler sur une grille a patisserie. Servir tiede. Recycling? This looks gourmet to me! Nice job! C'est sur que si c'est tout vert et que ca bouge tout seul dans le frigo, faut pas mettre la dedans ;-) mais sinon c'est bien sympa !!!! hey what a wonderful way to use up left overs.I swear no one would've guessed that was an effort to clean up the fridge but it looks like u went thru a lot of trouble to make that.The almonds do add a nice touch ! Hurray for recycling! 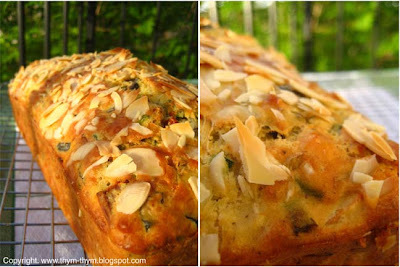 Your savoury cake sounds wonderful! There are some serious flavors going on there! Wow, I think I'm in love. So beautiful. oh my!!! My mouth can't stop watering, I'm not kidding! 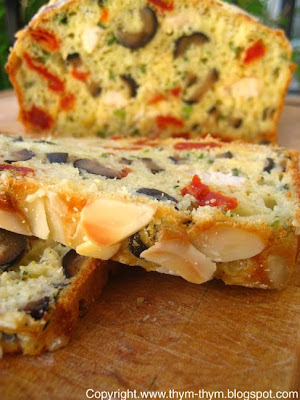 Rose, I love this savory cake, after read through you ingredient list, I love it even deeper!!! Next time I must save some roast just for this cake. Well this is haute recycling, then! Mmm il a l'air délicieux, ton cake! You are so talented. I can't believe you made something this beautiful out of leftovers! You give leftovers a good name! - Merci beaucoup cuisine plurielle de ce gentil message. - Well thanks Meeta. My recycling center is a 5 stars then. - Elle bouge chez toi ta nourriture... Tu me fais peur la. Merci beaucoup pour tes conseils sur le curry. -You are so nice Lis, I just wanna hug you. The cake does taste really good. It is light and very easy to make. - That's so sweet Kate. Thanks. Indeed, the almonds give this relief to the cake that I love. - Thank you very much Gilly. - You gotta have some flavor, Mike when working with left overs. Flava Flave... Did I just say that?? - My cake is interested too. I will see how I can give you its cellphone number. - You are always nice Gattina. I am glad you like it and I hope you will enjoy it as much as my little family and I did. You are welcome for the reply. - Thank you very much Susan. - Merci beaucoup Astrid. Ta mousse au chocolat est pas male non plus. - Me, talented? reaaally? Can you say it again, just to make sure? This is so nice of you Kristen. Thanks Thanks. - Thanks. I like to spoil my leftovers Nora. Wow, this is some seriously good recycling, Rose! It looks so colorful and delicious! Woman, if that's recycling you'd think it would get everybody on board. That is really gorgeous!! Awesome!!! J'aime beaucoup la texture de ton cake . - En plus tres pratique pour les dejeuner au parc. Merci pour ton gentil message Lilo. What a fab idea and the cake is GORGEOUS! This one is going on my list of things to make. Thank you very much Claudia for your nice comment. I am glad you like it. Let me know how it goes if you try it.